Vietnam’s path to economic growth has been a checkered one. After having been under French colonial rule since 1858, Vietnam declared its independence in 1945, which led to war the next year. Following the French defeat in 1954, talks were held in Geneva between the French government and the Viet Minh, and the country was divided into North and South Vietnam. The division led to an ongoing struggle between the two newly formed nations, culminating in a war that drew in foreign powers such as the United States. Eventually, Vietnam was reunited in 1976 and emerged as the Socialist Republic of Vietnam. Since unification, Vietnam has been led by a communist government and had a fairly closed, centrally-planned economy until the mid-1980s when the government put into place the “Doi Moi” or Reform policy with the aim of opening the economy up and introducing a more liberal market structure. The government aimed to switch Vietnam from an import-substitution economy to an export-orientation economy. Vietnam also began participating in an increasing number of trade partnerships, including joining the ASEAN, the World Trade Organization and most recently the Trans-Pacific Partnership. The opening up of the economy has led Vietnam to becoming a lower-cost alternative manufacturing location to China. 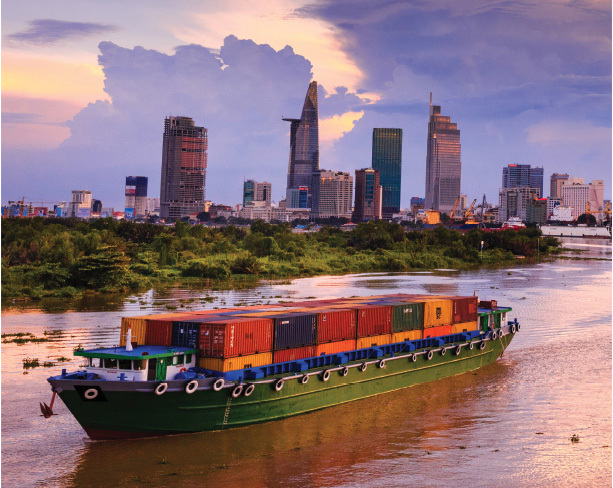 The fact that Vietnam has an abundance of low cost labor and is well situated to take advantage of existing global supply chains has appealed to corporations. Samsung has been one of the biggest investors, and manufactures a large part of its telephone inventory in Vietnam. Similarly, Intel, Canon, and Panasonic have all built manufacturing plants in the country. While currently the demands are more for assembly line type work, if Vietnam is able to improve its talent base, there is a high potential for it being able to attract more sophisticated kinds of manufacturing. IT Outsourcing has seen a rise in interest as well. Vietnam is also attracting investment in other sectors such as shoe and apparel manufacturing. Shoe manufacturer Wolverine Worldwide has moved much of its production into Vietnam. Vietnam now manufactures 30% of its inventory, while China’s share has reduced from 90% to 50%. With increasing numbers of corporations relocating to Vietnam, Corporate Real Estate (CRE) will see an upswing in demand for its talents and services. As of now, however, CRE and Facilities Management are not widely understood in the local market and are typically viewed as property management services, which are transactional or building engineering services focused. The strategic aspect of CRE is not yet appreciated and many issues are still dealt with on a small and local scale. Other challenges that CRE faces include a shortage of home grown talent, a lack of clarity around guidelines and rules for real estate professionals, and a dearth of transparency about the real estate market. Convoluted land use and purchasing laws can make things problematic as well. However, the overall outlook for Vietnam is positive. A young population, a growing middle class, and a government keen on pushing the economy higher are all factors that will influence growth positively. As the economy develops and matures, the need for CRE to provide increasingly strategic guidance will grow as well.